Sam Bass was born at Mitchell, Indiana, on 21st July, 1851. Both his parents had died before he reached the age of 12 and for the next few years lived with an uncle. In 1868 he ran away from home and he eventually became a cowboy in Denton County. Bass was interested in horse racing and won a large number of races with a horse called Jenny. Later he was guilty of stealing other potential race horses. The money he made from these ventures was usually lost gambling in saloons. 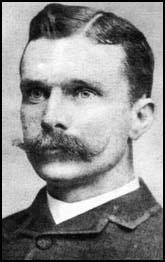 On 25th March, 1877, Bass took part in his first stagecoach robbery. During the robbery, the driver, Johnny Slaughter, was killed. Over the next few months Bass robbed seven more stagecoaches. On 1st September, Bass and his men carried out their first train robbery at Ogallala, Nebraska. This was highly successful and they escaped with $60,000 in gold. The gang was tracked down by the authorities and Joel Collins and Bill Heffridge were killed on 25th September. Jim Berry was shot dead in Missouri on 16th October and only Sam Bass and Jack Davis managed to return to Denton County. Bass now formed a new gang and after several stagecoach robberies they held up the Houston and Texas Central railway express near Dallas on 22nd February, 1878. Three more train robberies followed soon after at Hutchins (18th March), Eagle Ford (4th April) and Mesquite (10th April). Unlike the robbery in Nebraska, these attacks were not very profitable. Bass now formed a new gang and decided to try his hand at robbing banks. He selected the bank at Round Rock in Williamson County as his first target. However, one of his new gang members, Jim Murphy, was a spy. The authorities were waiting for him and on 19th July, 1878, there was a shoot-out at Round Rock. Bass was badly wounded and died two days later on his 27th birthday. A dispatch was received by Sheriff Bassett last Wednesday from Superintendent Morse, stating that the train robbers had started south and would probably cross the A. T. & S. F. near Lakin. Accordingly Bassett, under-sheriff Bat Masterson and John Webb went west on the Thursday morning train: but they heard nothing of the robbers and returned Friday morning, thinking it more likely that the robbers would cross near Dodge. A few hours before they arrived news was brought into town that five men had crossed the railroad going south about thirty miles west of here. As soon as preparations could be made, Bassett, Bat Masterson and Webb started south-west on horseback, intending to try to intercept the robbers if possible. Assistant Marshal Ed. Masterson and Deputy Sheriff Miles Mix went west the same day to find out what they could about the men who crossed the road. They could learn nothing of any importance except that the men had been seen on Thursday morning, but no one had taken particular notice of them. Masterson and Mix returned the same evening. Nothing has been heard from Sheriff Bassett and his men since they started from here yesterday morning.